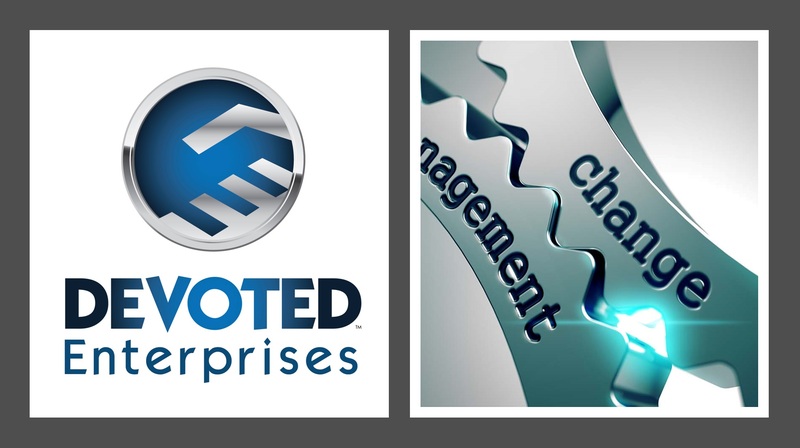 Change Management Consulting - Devoted Enterprises Inc.
At Devoted Enterprises, we specialize in change management for your business. Whether you need to streamline your operation, improve profitability, or improve production, productivity or get current with the times, we can help you. As in any change management situation, ownership and leadership first needs to decide that they do need to change, and then what that change looks like. This often is a very difficult decision to come to on your own. That is why we offer free initial consultation in this area. If you would like to find out more about how we can help you decide whether change management is right for your company, contact us today. Once the decision has been made an agreed upon that change management is necessary, the next thing you in your business needs to do is to define what necessary processes, systems, or technology needs to change to improve your business ad meet the goals that you have. This usually involves organizational structure review as well and is the main reason we offer change management services for our clients. Once retained by the company, we will work with you to help you define these areas and more and help you create an action plan on how to step by step improve your business and get it to where you want it to be today. We would love to talk to you today about our change management services or any other services that we can provide to make your business more profitable, more successful, and improve your work life balance as a business owner. Call us today for more information at 952 582-4669 or Contact us at any time.